Glacier National Park was the last stop on our 2017 summer road trip. I have a soft spot for national parks, and this one had been on my list for a very long time. Since it was on our route home from Banff, we decided add Glacier to the trip. I am so glad we did. It was amazing, and we can’t wait to go back. Let me start by saying that Glacier National Park is huge. We did not see half of the park, but we were able to check quite a few must-see spots off our list. To give you an idea of how much ground we were able to cover in just two and a half days, I numbered our stops on the map. I’m hoping it will give you an idea of how the park is laid out. If your family is planning a future trip to Glacier, I would recommend spending at least three days in the park so you can get everything in. A week is ideal. We stayed four nights and three days total in Glacier National Park. We spent all four nights on the west side of the park, which was perfect because the weather was much warmer there. 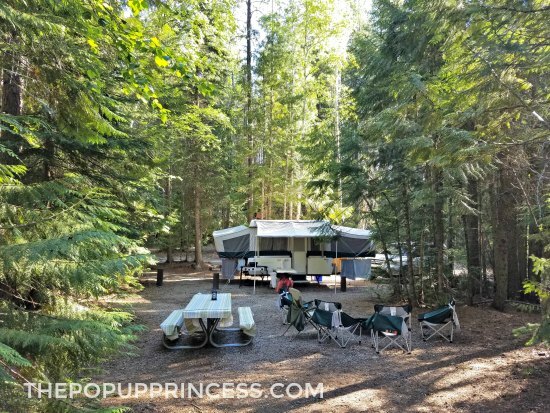 Our first two nights were spent at Fish Creek Campground (#1 on the map) inside the park. It was an awesome campground along the bank of Lake McDonald. It was not only beautiful but also very conveniently located. Because it was on the lake, the mosquitoes were quite bad–even in June. We packed along a Thermocell Lantern, which did a pretty darn good job of keeping them at bay. I was very thankful we decided to splurge for it before the trip. This little lantern was worth every penny. Because there wasn’t room for us to stay four nights at Fish Creek, we split up the stay, spending the last two nights at West Glacier KOA. I had my doubts initially, but West Glacier KOA was also a really great campground. In fact, the showers here were some of the best we’ve seen. Of course, there were pros and cons to each campground, and I’ll be writing a post very soon that details our stays at each. However, they were both extremely convenient and each made a great home base for our daily outings. We spent our first day in Glacier National Park at Apgar Village and Lake McDonald (#2 on the map). It was incredibly close to Fish Creek Campground, and Mr. TypeTwoFun and the kids were excited to do some kayaking on this trip. 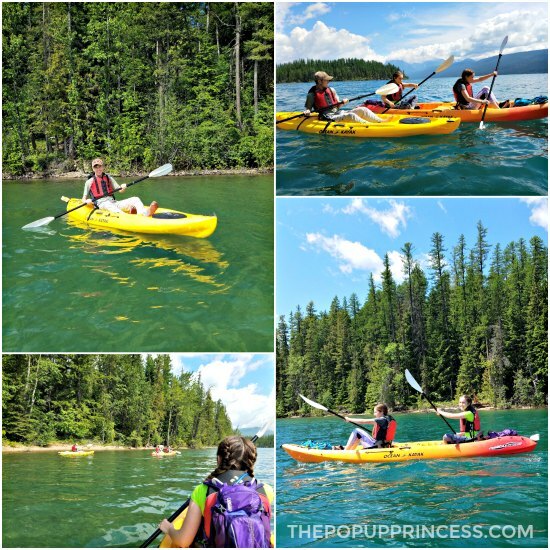 We found a great spot in Apgar Village to rent kayaks. There are actually several companies in the area that rent kayaks, stand up paddleboards, and canoes to take out on the lake. It cost us just under $100 to rent two tandems and a single kayak for two hours, and it was the perfect way to spend our first morning in the park. The lake was pretty empty when we first put in, as it was a little cold and overcast. We had the whole lake to ourselves for a good hour. As the sun came out, more people hit the water. By the time we finished, it was pretty difficult to find a spot to pull the kayaks ashore. The beach was that crowded. Our suggestion would be to visit the lake as early as possible if kayaking is on your schedule. 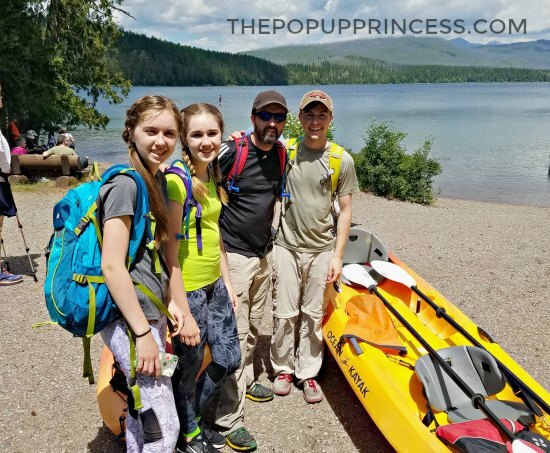 We loved the experience, as the scenery is beautiful and Lake McDonald is quite large, but we didn’t love the crowds. 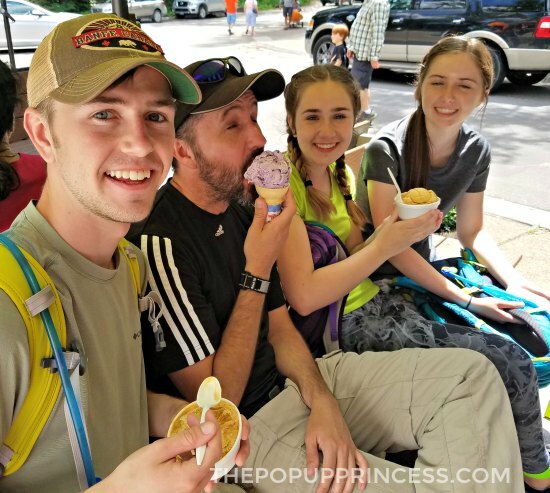 After our kayaking adventure, we hit Apgar Village for souvenir shopping and ice cream. Definitely try the huckleberry ice cream. It was delicious. We were also able to fit in a short trip to historic Lake McDonald Lodge and the Apgar Visitor Center. 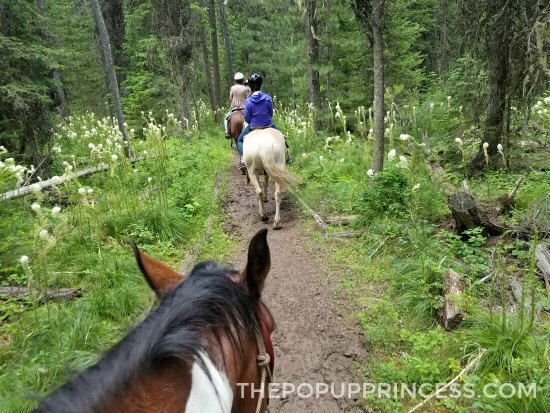 While we were in the area, we decided we really wanted to do a horseback ride through Glacier as well, so we hit the Lake McDonald Stables. If this is something you even think you want to do while in Glacier, I would absolutely recommend making reservations early. Our ride was a last-minute decision, so we had to take what was available. I have heard the rides from the Many Glacier and Lake McDonald are much more scenic, but they were completely booked. The only trips available were the one hour trips from the Apgar Stables, and even then there were only four spots open. I snatched those up on the spot. I ended up skipping the ride myself, because there wasn’t space for the whole family. Mr. TypeTwoFun and the kids came home raving about the experience, though. They had funny stories about their guide and a few of the horses, and this is one of the things they talked about for days. 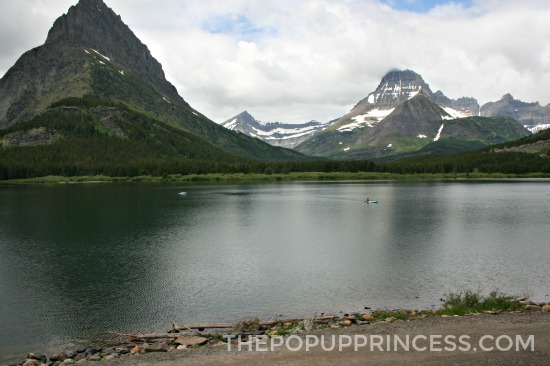 We visited Glacier National Park early in the summer, arriving at the very end of June. We didn’t realize that this would severely impact our ability to see certain areas of the park. 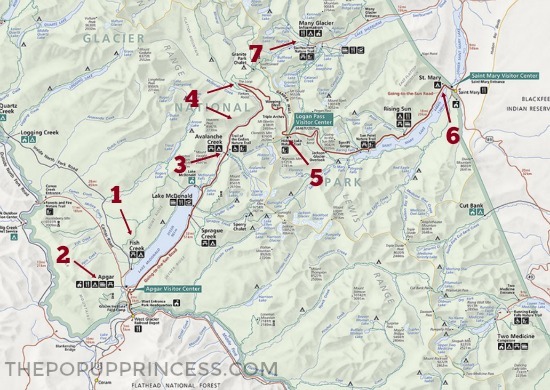 The Going to the Sun Road–that red line that runs across the map and is your gateway to East Glacier, marked in a few spots as #4–was not even open for our first two days in the park. In fact, when we arrived, no one was quite sure when it would actually open, as there is no set date. It is completely dependent on the weather. The road is covered with snow in the winter, so it must be plowed before it can be opened for summer. Late spring snow storms can cause havoc on the plowing schedule, and opening dates change every year. Fortunately for us, the road opened on our last full day in the park, so we hopped in the car and headed out to see what all the fuss was about. We were stunned by the amazing natural beauty along this area. The snow was melting, and water was flowing all along the mountains above the road. 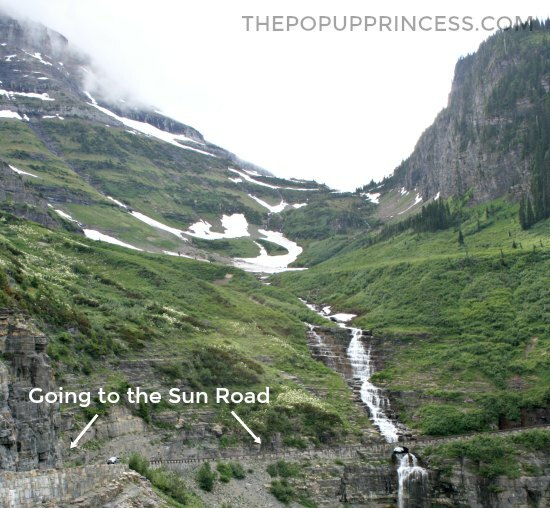 There are several pull-outs and picture spots along the Going to the Sun Road, and I suggest you take advantage of them. It is hard to take in all the beauty around you while you are trying to drive safely along this winding, narrow road. Stay safe and pull aside at the lookout points to take in the view. 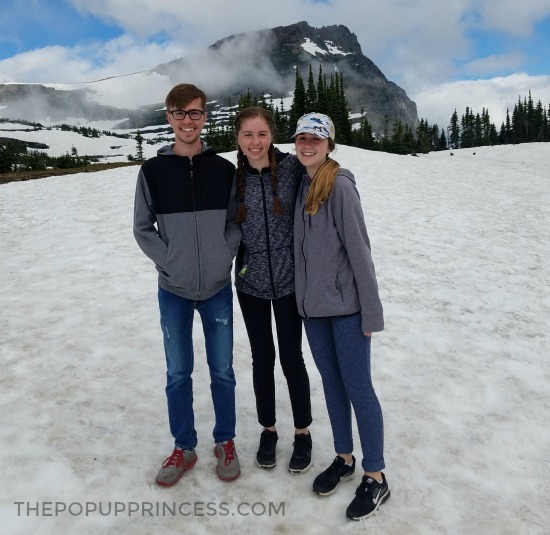 Once we got to the Logan Pass Visitors’ Center–the highest elevation in the park reachable by car and #5 on the map–we were stunned to find that there was still quite a bit of snow on the ground. We had planned on hiking to Hidden Lake from Logan Pass, but once we got out of the car, we realized this was not going to happen. We started out along the trail, but the snow was slick and compacted. We weren’t dressed for the terrain, and after a few stumbles, we realized that we were going to have to skip this hike. I’d read that along the Hidden Lake Trail was the place to see wildlife, especially mountain goats, so I was pretty disappointed that we had to turn back. Our advice? If Logan Pass and the surrounding hikes are on your itinerary, make sure you visit later in the summer. An added bonus of planning a late summer trip to Glacier is that you’ll be able to take advantage of the shuttle system. That wasn’t available during our stay. Since Hidden Lake was no longer on the agenda, we decided to drive the rest of the Going to the Sun Road and visit the eastern area of the park. 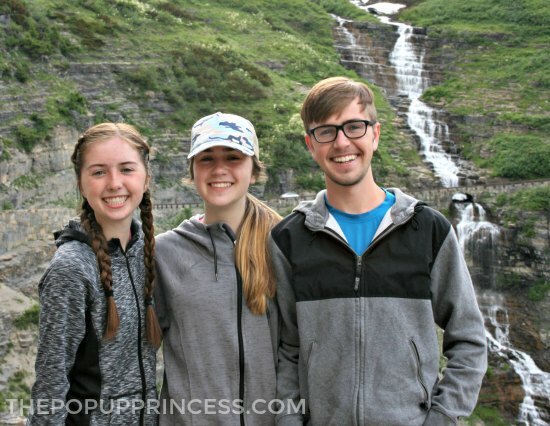 We were keen to see an actual glacier (spoiler alert: you can’t see much), and we’d heard the scenery in Many Glacier was amazing. 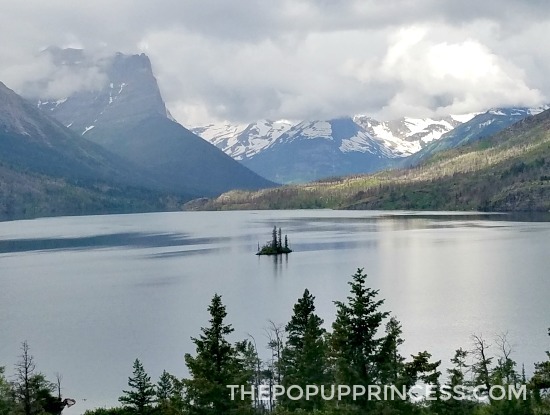 The Going to the Sun Road runs along Lake Mary, where you catch a glimpse of Wild Goose Island. This is another iconic image associated with Glacier National Park, and it is pretty breathtaking. It was overcast on the day we visited, so my picture doesn’t really do this area justice. On the way to Many Glacier, we stopped at the Lake Mary Visitors’ Center (#6 on the map), and I have to say this is the best visitors’ center in the park. 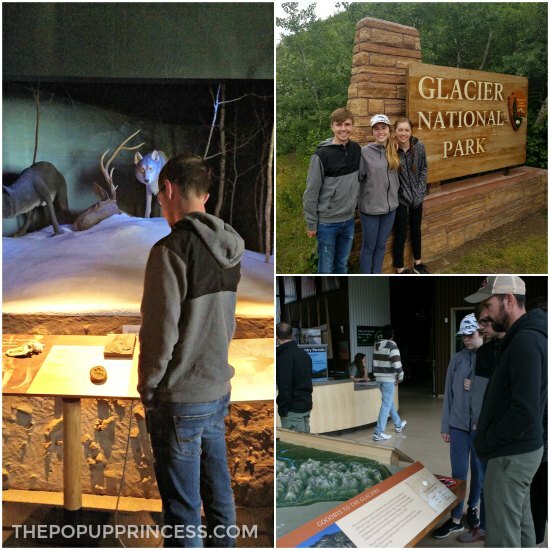 There were exhibits on the many glaciers throughout the park and how they are shrinking. There was also a very cool exhibit on the wildlife and native peoples that called Glacier National Park home. After the visitors’ center, we continued on through the Many Glacier entrance to the park, where we snapped our requisite picture in front of the park entrance. The entrance at Many Glacier was deserted, and we didn’t have the crowds that were lined up for photos at West Glacier. This could have been due to the time of year and stormy weather, but we noticed that the Many Glacier area was far less crowded than West Glacier in general. 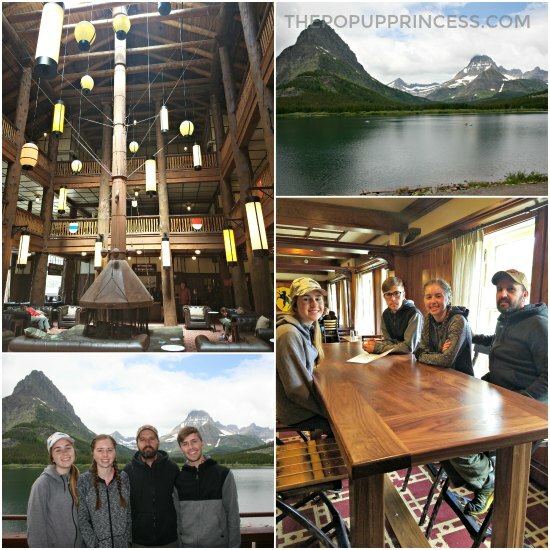 Because the weather was pretty gloomy and cold, we didn’t do any hiking in Many Glacier, but we did get a chance to see the historic Many Glacier Hotel. Built in 1915, Many Glacier Hotel sits on the banks of Swiftcurrent Lake. It was built in a Swiss chalet style, as this area is often called the “Switzerland of North America.” The hotel perfectly compliments the landscape, and we really enjoyed the Swiss theme throughout. 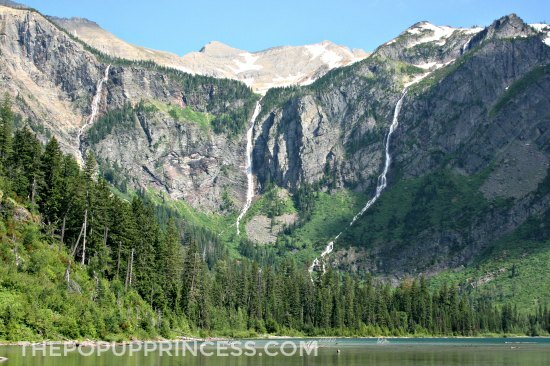 On our way back from Many Glacier, we hit The Trail of the Cedars and Avalanche Lake (#3 on the map), which are some of the most iconic spots in Glacier National Park. You’ve almost certainly seen pictures of them. 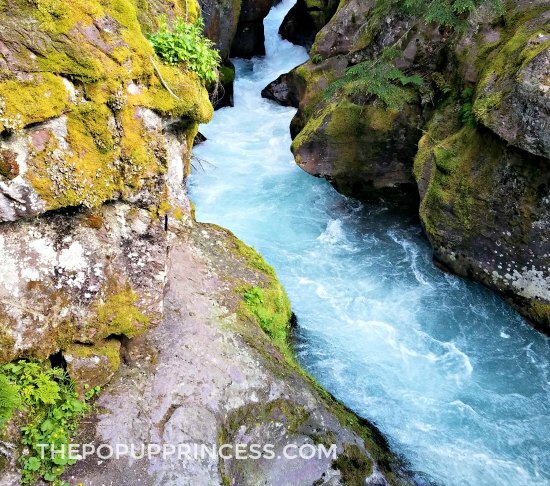 The water in Avalanche Creek is such a beautiful glacial blue color, and it makes for some gorgeous photos. The Trail of Cedars is a short one mile ADA accessible hike along a boardwalk while runs along Avalanche Creek. It is very easy, and so worth it, but parking can get hairy. We suggest arriving early in the morning or later in the evening for better access. If you are in the mood for a slightly more strenuous hike, you can continue on to Avalanche Lake. This trail is approximately 4.5 miles roundtrip with a 730 foot elevation gain. Mr. TypeTwoFun and the kids had no problem with the hike, but I was pretty out of shape. It took me a bit longer than I would have liked to reach our destination, but the payoff was incredible. Look at that! Avalanche Lake was amazing. It was so peaceful, despite the crowds. Because it is pretty remote, it wasn’t nearly as crowded as some of the other areas of the park, but there were still quite a few people there. We took our shoes off and played in the water for awhile before heading back the way we came. Even though the return trip was the same scenery as the trip in, it was still beautiful, and we were constantly noticing things we’d missed the first time around. I highly recommend hiking to Avalanche Lake if you are able. It was one of my favorite parts of Glacier. This is our number one tip… If you are looking for the full Glacier experience, consider planning a trip in the warmer months of July and August. 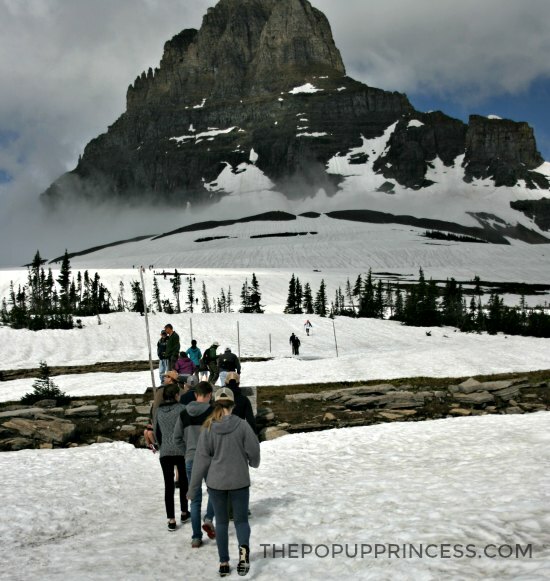 We hit GNP IN the tail-end of June, and it was still very cold. We had rain most days. There was still quite a bit of snow on the ground in places, and some of the trails were not yet open or covered in snow. We weren’t able to see much of Logan Pass and had to skip the Hidden Lake hike we had planned due to deep snow. Check the opening dates for the Going to the Sun Road religiously. You can check the status of the road here. There is no set day for the opening of the road. It all depends on weather conditions, and spring snow storms can hinder plowing of the road. It was opened on June 29 for our trip, but we were not actually sure the road would be open until that very morning. When we checked in the Apgar Visitors’ Center at the beginning of our stay, no one could give us a solid answer. We lucked out, and the road opened a few days into our stay. Typically, you are safe if you plan a mid-July trip, but weather can be unpredictable. Even though the parking can be quite difficult, don’t miss the Trail of Cedars. 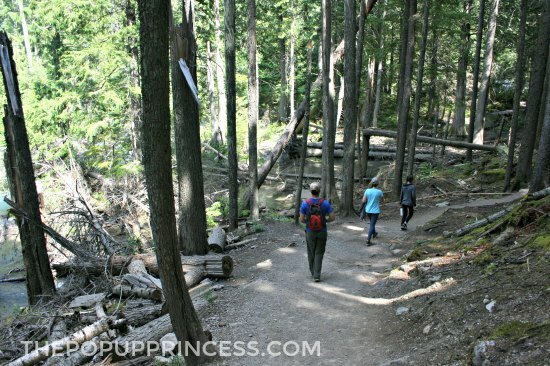 It is an easy walk, and the boardwalk hike along Avalanche Creek is beautiful. If you are physically capable of a moderately strenuous hike, be sure to continue on to Avalanche Lake. You will have fewer crowds and be able to enjoy some pretty idyllic views. 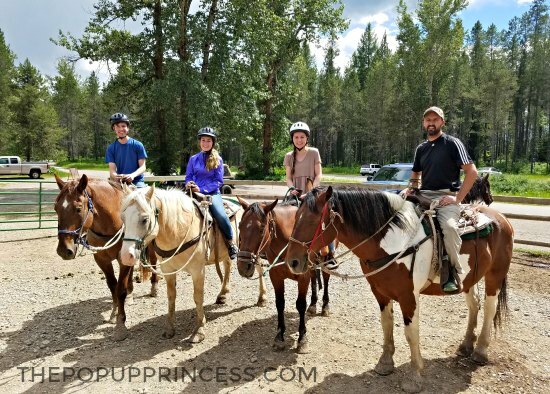 If horseback riding is on your agenda, make reservations (through Swan Mountain Outfitters) as soon as possible. Some of the more scenic trips fill up early, and in the later summer months, it can be almost impossible to find a walk-up reservation. We took a short one hour trip called the Lodgepole Loop, as that was all that was available. The kids really enjoyed themselves, but I really wish we would have had the opportunity to book a trip out of the Many Glacier Stables. I hear the Cracker Flats ride is one of their most scenic trails. 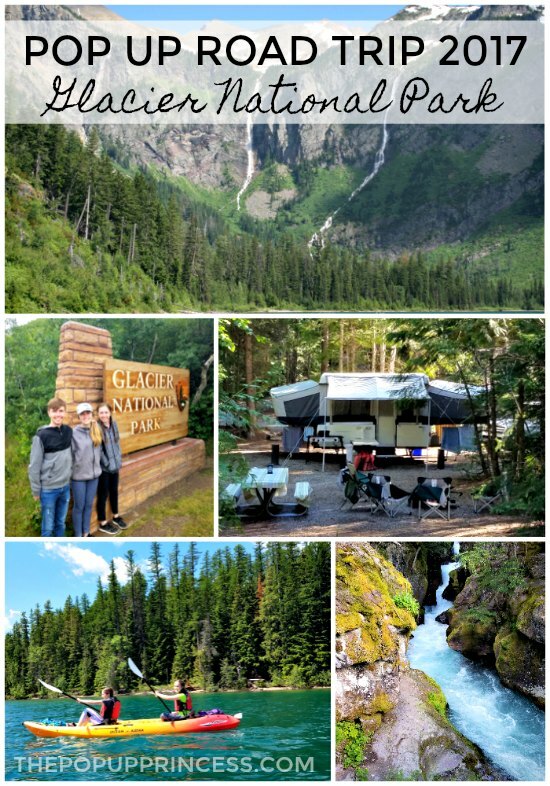 There are plenty of campground options in Glacier, depending on your preference. 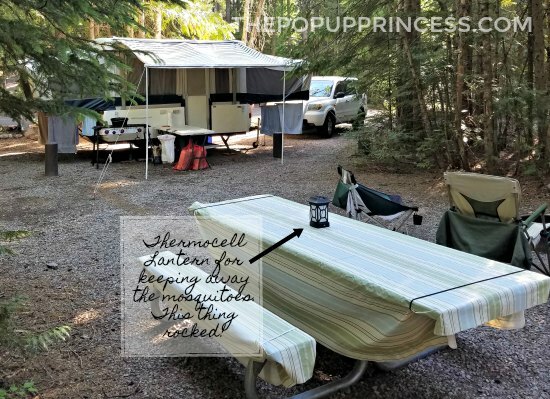 We stayed in West Glacier at Fish Creek Campground (no hookups) for a few days before moving on to a KOA Kampground with hookups. If you need hookups, laundry, and great showers, we highly recommend the West Glacier KOA. It was very clean and the staff was so friendly. There is also a pool and ice cream parlor for those warmer summer months. My kids loved that. Loved your story on Glacier National Park. 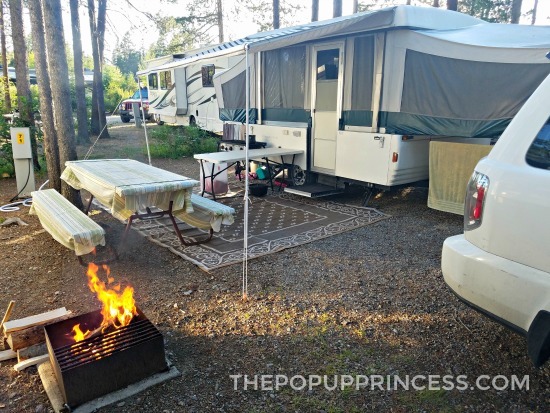 We are going there for a week in mid-July and staying at the KOA with our pop-up. Cannot wait for the adventures. Glad you and your family got over to visit that lovely corner of my state. Glacier is an amazing place but, as you found, can be fickle. I lived up there for a few years and worked on a trail crew – – my first season of which I helped rebuild about 1/4 of the Trail of the Cedars so I was quite happy to hear you enjoyed it so much. Looks amazing. We are going to Disney Wilderness Lodge this fall driving from Canada, it is our first “long” road trip with our pop up trailer, nothing as cool as some of the trips you have taken but it’s a start. Wondering where you stop along the way. Do you book sites on your route, look for free camp grounds or maybe even stay at flying J’s? I’m obviously hoping to keep cost down since for this trip we will be looking to just sleep and move on, perhaps on a future road trip we will stop and smell the roses along the way. Also want to make sure it’s safe, not sure how safe the free camping/truck stops are. I would appreciate any tips and resources you could provide us with. 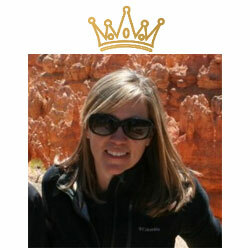 Your site has been so helpful to us, and was truly inspirational when we bought our pop up, re-did so much of it. Thrilled to hear you loved Glacier. I’m grateful to live in Montana and have the ability to spend time in Glacier whenever we want. You summed up everything perfectly and we LOVE the KOA. Swimming pools, meals in the pavilion and ice cream! Please come again! Definitely, Catherine. We hit the East Coast this summer, but can’t wait to head back up to Glacier soon. It was my favorite national park ever.